Today, people from all over are traveling everywhere. With such an increase in diversity, the common question is: where are you from? People want to know where your ancestors are from. It fulfills a not-so-secret curiosity, the same one that propels people to travel. What if you plate it for people? With, say, haggis. Curiosity and belly simultaneously sated. Just outside of Sherbrooke, Québec, the inn is situated in the old general store in Gould — a town with historic Scottish pioneer roots. 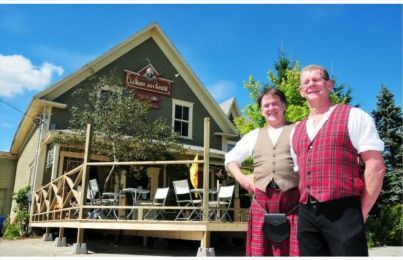 The duo started the inn in 1995 to put the local “Scottish culture on display.” As well, the Scottish flair for entertaining was taken into account. Sporting kilts, the pair serve an authentic Scottish brunch consisting of 40 items. And you’d come here looking for authentic French culture.